Hello fellow tappers, today EA brought us a new tie-in update: The Musk Who Fell to Earth. The following is the complete Walkthrough for the questline. Ugh! Not another TV sitcom featuring a fat guy who sits on the couch all day! Homer, the power’s been out all morning. Then what have I been sitting on the couch watching all day? Man, I’ve really let myself go. Well, the easiest way out of any hole is through the bottom. No power means no stove means no bacon. Hey, Dad, come quick! Mr. Burns still has power! Don’t answer, just get me my angry mob pants. You lost your angry mob pants during yesterday’s angry mob. Then get me my church pants. I’m usually pretty angry there too. 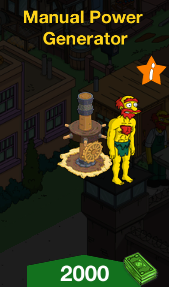 Hey, Burns, how come you get power while the rest… most importantly me… don’t? It’s not fair! We’re living like backwoods deadbeats! Springfield Nuclear is now offering “premium service” where VIP clients get access to power before the rest of you. But there will still be plenty to go around for the poor. Like lifeboats on the Titanic. Or scholarship positions at prestigious universities. 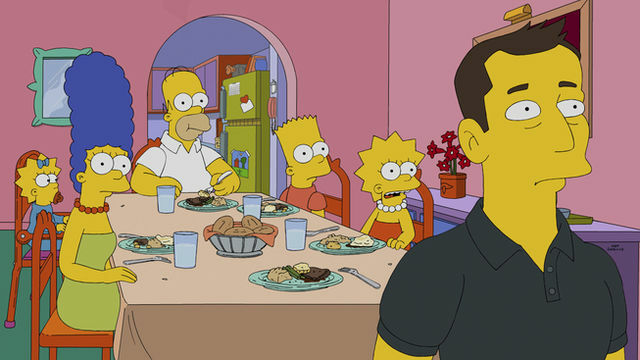 System Message: Tune into this week’s Simpsons to see the Henry Ford of now times… Elon Musk! Sunday 8/7 central on FOX. System Message: The electric car is now available in the store. …but Willie cannot stand un-microwaved burritos! System Message: Pick up the Manual Power Generator to get Slave Labor Willie! This is awful. Just think what these blackouts are doing to the moth community! What will they flock to? Mr. Burns’s? His place is lit up like a Christmas tree. And his Christmas tree is lit up like some sort of SUPER Christmas tree! Kinda early to have it out though, if you ask me. Willie is right. We need to do something. I am accustomed to committees, bureaucracy, and red tape! Sir, a group headed by an eight year old girl has issued a stern letter in favor of power grid neutrality. Incinerate the letter and send her the usual response. But sir, she’s a minor. You’re right. Send her a pony head instead. Mr. Burns: So young lady, does your organization hold any actual authority? Not legal authority, but considerable moral and ethical authority. So unless you are here with a business proposal, I’m afraid I’m going to have to release the hounds. They’ve got new electrified collars and very, very long extension cords. A business proposal, hmm… what’s nuclear power’s biggest competitors? Giant radioactive monsters that crawl out of the ocean and attack our cities? All you have to do is promise cheap electricity to everyone who buys one. You win AND the environment wins. Is there any way to make it just me that wins? I don’t know… You’d have to work pretty hard to pollute the earth more than the oil companies. That Mr. Burns really scalds me haggis! I know, but what choice do we have? His plant is the only source of power in town. There’s one source of power Mr. Burns doesn’t have control over — the human spirit! By which I mean witchcraft. Willie: Ach! So was I able to man-power-up the town? Um… I think I saw a light bulb flicker. It could have been a firefly, though. Sounds like a job well done! Now to celebrate with a hearty meal. This beautifully designed feat of engineering is really going to change things around here. Ehnn… how fast does it drive? So it’s not going to change anything, is it? Just like the real electric car. Hope you enjoyed this tie-in and don’t forget to tune up this Sunday on Fox for the newest episode of The Simpsons, The Musk Who Fell The Earth. Happy tapping everyone! It appeared the ELON was playing Tapped Out on the screen in his ship at the end of Sunday’s episode………..LOL! Cynical New Yorker speaking – What a coincidence: the 3 electric cars cost the same as the islands, 120 donuts. So after buying the cars, can I expect EA to give them away to everyone for free? Ugh. Screw me once shame on you, screw me twice shame on me. Not happening. Interesting. Has anyone purchased these E-Cars or plan to? Do you like them? How large are they? Would you say they are worth the donuts minicha? I like them fine. About the same size as other cars. Best buy is the yellow, if youre looking for most bonus/donut (I think). For me, this is an acceptable price range for vehicles. Hey, is there any rhyme or reason to deciding which episodes get tie-ins? Thinking back on those I can remember offhand, a few are obvious landmark episodes, like season premiers and finales, or the Futurama crossover. But mostly, they seem to be chosen more or less at random. The net neutrality ‘satire’ in this quest is sooooooo hamfisted. Huh, so Willie’s quest is only two steps after all, that’s not a mistake. I was wondering why he wasn’t prompting me to do more; I figured it would involve each of his five regular tasks. I should be used to it by now, but I have to say, it feels pretty lazy. Especially since this skin and the non-bonus-increasing decoration that comes with it are the only new content in this tie-in. Well yeah, that too, for premium players. 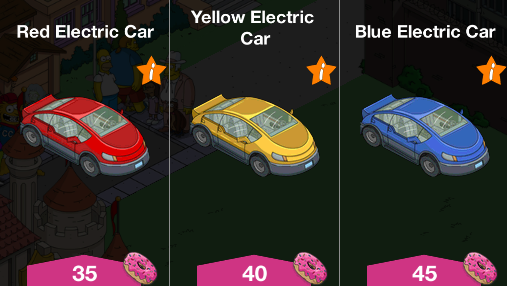 ELECTRIC CARS – can these new premium/donut decorations actually be placed on the roads – does anyone know? THANKS! And that’s exactly the reason why I’m not gonna add them to my town. More importantly, who holds back the electric car? Who makes Steve Gutenberg a star? Is that Slave Labor Willie, a cotume or a new character?? Why don’t they give us this Musk guy? Probably because he’s a real person. well then what about Matt Groening? Matt Groening is the Simpsons creator. No need for licensing there. Whereas Mr. Musk may require payment to use his likeness in the game. Really? Never heard of him. And the name does sound like a fictional character. Next What changed with the Queen Helvetica and Elon Musk update?